French infantry officer's sword from the collection of famous American stage actor Otis Skinner. From the Otis Skinner and Cornelia Otis Skinner collection, a beautifully made French infantry officers sword and scabbard, which would have been used for ceremonial purposes. This sword has been in the Skinner family for a good part of its life. The Skinners travelled extensively, and had a Paris apartment as well. This was possibly initially purchased as a stage prop. Eventually this became part of their personal collection in their New York apartment. This sword was manufactured by the Chatellerault Company, who manufactured swords 1816-1937. This sword is model 1882, manufactured in November 1916, during WWI. This information is engraved to blade. The hilt is horn, wrapped with brass wire, with 4 bar brass guard, initialled M.J.A.B. The blade has a very good point, no deviation or warping to either side, and scabbard is intact. The tang extends through the handle, and the balance is excellent. All parts are in very good condition with original patina. Size 40 inches long including scabbard, 38.5 inches long alone. A very nice sword with excellent provenance from the collection of famous actors, interesting both for the collectors of swords and militaria, or acting memorabilia. 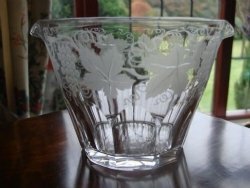 19th century beautiful cut glass rinser with engraved design of grapes and leaves. 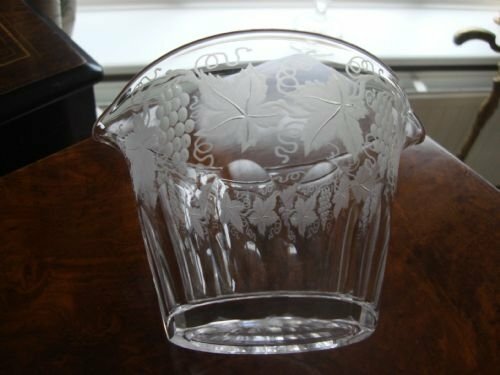 19th century lovely cut glass double lipped glass rinser with thumb cut panels to base surmounted by a beautifully engraved design of leaves and grapes. 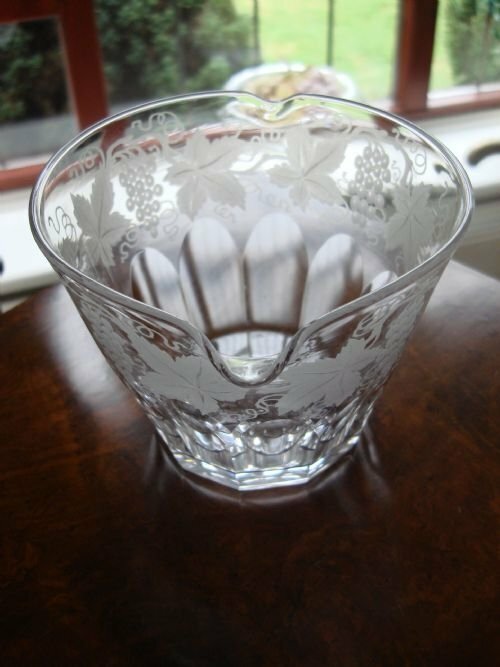 Glass rinsers or coolers were originally used to rinse or cool wine glasses between courses. The glass was turned upside down, and the stem rested against the lip. Now, they are often used to hold ice when serving drinks at the bar, and the ice tongs rest against or hang on the lip. Also a great piece for the collector of antique glass. 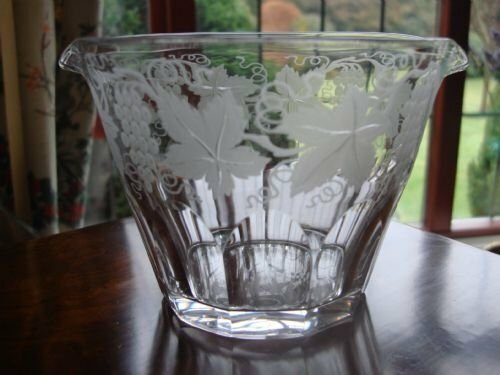 This rinser is particularly unusual due to the combination of both engraved and cut design. Size-approx. 4 inches high by 5.5 inches wide (lip to lip). In very good condition, this would make an excellent and functional talking point at a drinks party. Sold individually, this is one of only 2 remaining available. The last photo shows the original four. They are lovely either individually or used as a pair. 1800-1825 Crown Derby porcelain lozenge shaped plate with gilt leaf decoration. 1800-1825 Crown Derby porcelain lozenge shaped plate with gilt leaf decoration on pale pink banding. No damage, but some minimal age discolouration and some wear to gilding. Size-8 5/8 inches wide by 6.75 inches high. Very pretty plate to use or display. It has a beautiful glow near the light. Matches oval Crown Derby plate also listed. 1800-1825 Crown Derby porcelain oval plate with gilt leaf decoration. 1800-1825 Crown Derby porcelain oval plate with gilt leaf decoration on pale pink banding. No damage, just some wear to gilt. Matches lozenge shaped Crown Derby plate also listed. Size-10 7/8 inches wide by 8.25 inches high. Pretty plate to use or display. 1843 marked Elkington silver plate large pierced slice. 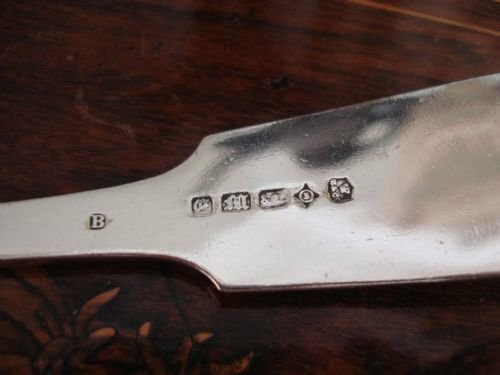 Marked for 1843 with their unique marking system, this is a generous pierced and shaped slice made by Elkington and Co., famous makers, credited with discovering the best silver plating process. This slice has lovely piercings to the blade and a fiddle pattern stem. There is minimal rubbing to the plate. Size-13 inches long by 3 inches wide. 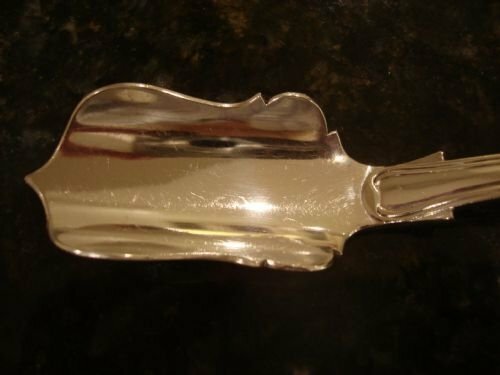 A great slice to use for serving fish, cake and desserts, in good condition. 1850-1890 Victorian majolica 5 piece pond lily and heron service comprising four plates plus comport or cake stand. Victorian 1850-1890 majolica five piece service comprising 4 plates and a comport in the pond lily and heron pattern. Pictured in the Collectors Encyclopaedia of Majolica, they feature overlapping lily pads with a lily blossom in the middle. Rarely marked, such pieces are usually made by Wedgwood or Holdcroft. The comport features herons standing amongst reeds on each foot, and has a gorgeous mottled glaze to back. There is a fine hairline to one plate. It is rare to find so many pieces together. Size 9.25 inches diameter. Comport is 3 inches high. 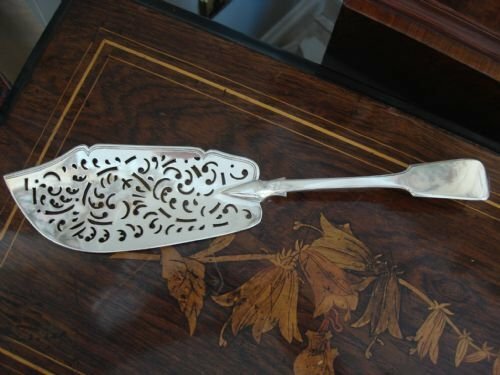 1853 marked beautifully shaped and heavy Victorian silverplate stilton scoop by very famous maker ELKINGTON. 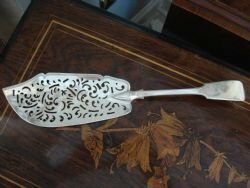 1853 dated wonderful quality heavy stilton scoop by famous maker Elkington and Company, in the double struck fiddle thread and shell pattern. It is made in a heavy gauge, and is well balanced in the hand. Stilton scoops were developed to deal with scooping a serving of cheese from a full or half wheel of Stilton cheese. The implement had to be efficient and unable to be easily bent. 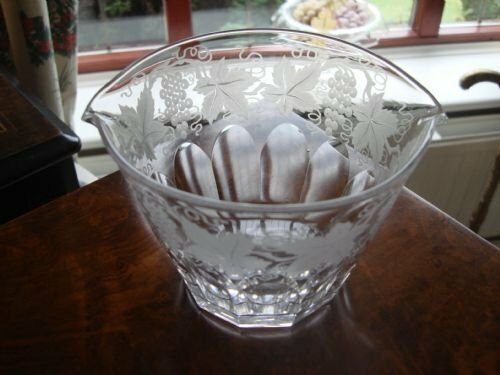 These were very popular from the mid 1700's to the end of the Edwardian era, and are much desired and prised today. Elkington, credited with inventing the silver plating process, marks all their silver plate with date codes, hence the accurate dating for this piece. It is has a very unusual shaped curved and pointed scoop, sharp shoulders, and a shell to both the stem and the heel of the bowl on the reverse side. In addition, the stem bears a delightful family crest of a rampant lion holding a crescent moon. Size-8 inches long by 1.25 inches wide. This is a fine quality and very functional Stilton scoop in very good condition, very suitable for giving as a gift with a crock of Stilton cheese and perhaps a beverage of the recipient's choice! 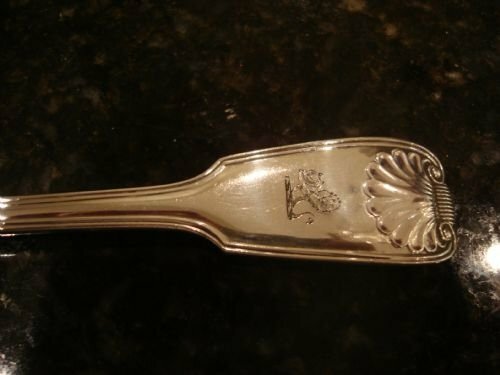 1866-1896 superior quality silver plate pierced sugar sifting spoon by Thomas Latham and Ernest Morton. 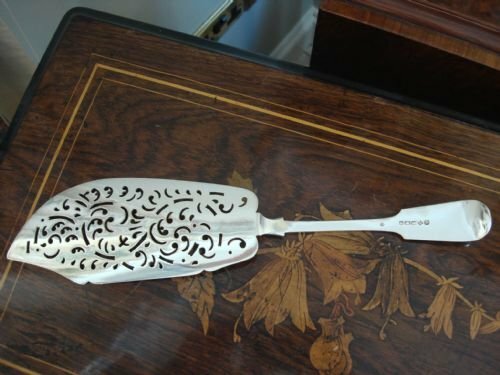 1866-1896 superior quality silver plate heavy double struck beaded edge sugar sifting spoon made by Thomas Latham and Ernest Morton. They only used these maker's marks during this period. Lovely heavy sifting spoon with curved stem, is beautifully made, and still as useful today as when originally made. Size-6 inches long by 2 inches wide.